When trading options, we often use the VIX index as a measure of volatility to help enter and manage positions. This works most of the time. However, there exist some differences between the VIX index and at-the-money implied volatility (ATM IV). In this post, we are going to show such a difference through an example. Specifically, we study the relationship between the implied volatility and forward realized volatility (RV)  of SP500. We utilize data from April 2009 to December 2018. It contains a basket of options, including out-of-the-money options. Therefore it incorporates the skew effect to some degree. 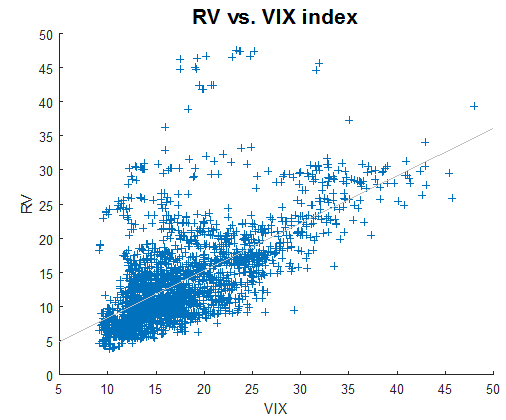 Plot below shows RV as a function of the VIX index. We observe that a high VIX index will usually lead to a higher realized volatility. The correlation between RV and the VIX is 0.6397. For traders who manage fixed-strike options, the use of option-specific implied volatilities, in conjunction with the VIX index, should be considered. In this example, we calculate the one-month at-the-money implied volatility using SPY options. Unlike the VIX index, the fixed-strike volatilities are model-dependent. To simplify, we use the Black-Scholes model to determine the fixed-strike, fixed-maturity implied volatilities. The constant-maturity, floating-strike implied volatilities are then calculated by interpolation. 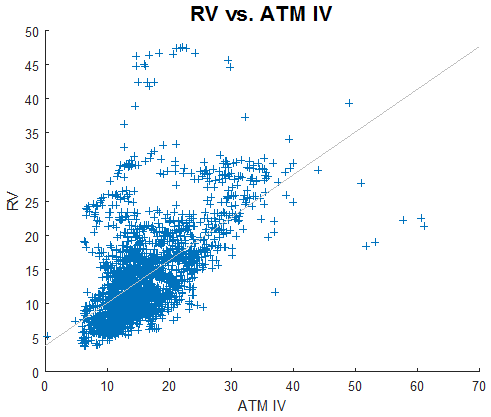 Plot below shows RV as a function of ATM IV. We observe similar behaviour as in the previous plot. However, the correlation (0.5925) is smaller. This is probably due to the fact that ATM IV does not include the skew. There are differences between the VIX index and at-the-money implied volatility. Higher implied volatilities (as measured by the VIX or ATM IV) will usually lead to higher RV. 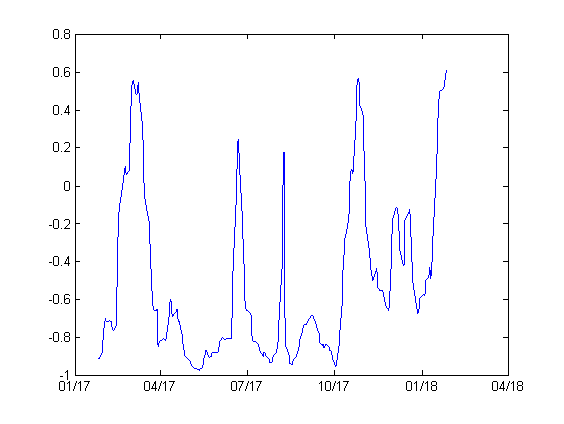 In this example, forward realized volatility is historical volatility shifted by one month. A lot of research has been devoted to answering the question: do options price in the volatility risks correctly? The most noteworthy phenomenon (or bias) is called the volatility risk premium, i.e. options implied volatilities tend to overestimate future realized volatilities. Much less attention is paid, however, to the underlying asset dynamics, i.e. to answering the question: do options price in the asset dynamics correctly? Note that within the usual BSM framework, the underlying asset is assumed to follow a GBM process. So to answer the above question, it’d be useful to use a different process to model the asset price. where β represents the impact of past shocks and h is a small constant. We note that and in case β=0 the price dynamics becomes GBM. When the underlying asset is mean reverting, i.e. β<0, which is often the case for equity indices, the MA(1) volatility becomes smaller. Therefore if we use BSM with σ as input for volatility, it will overestimate the option price. Conversely, when the asset is trending, i.e. β>0, BSM underestimates the option price. Time to maturity, τ, also affects the degree of over- underpricing. Longer-dated options will be affected more by the autocorrelation factor. Liao, S.L. and Chen, C.C. (2006), Journal of Futures Markets, 26, 85-102. Author rvarbPosted on December 31, 2018 Categories options trading strategies, volatility arbitrage2 Comments on Is Asset Dynamics Priced In Correctly by Black-Scholes-Merton Model? 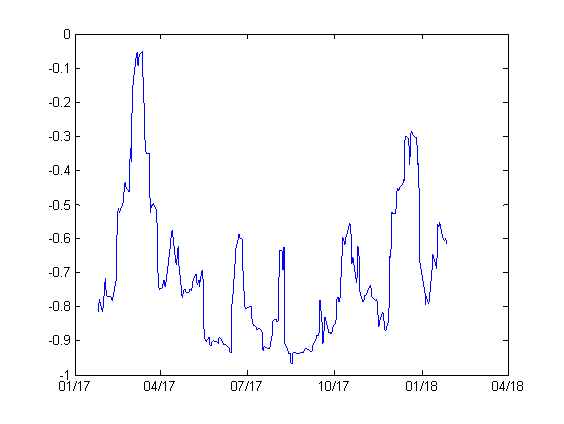 In a previous post, we showed that the spot volatility index, VIX, has a strong mean reverting tendency. In this follow-up installment we’re going to further investigate the mean reverting properties of the VIX. Our primary goal is to use this study in order to aid options traders in positioning and/or hedging their portfolios. To do so, we first calculate the returns of the VIX index. We then determine the quantiles of the return distribution. The table below summarizes the results. We next calculate the returns of the VIX after a significant volatility spike. We choose round-number spikes of 3% and 6%, which roughly correspond to the 75% and 85% quantiles, respectively. Finally, we count the numbers of occurrences of negative VIX returns, i.e. instances where it decreases to below its initial value before the spike. Tables below present the numbers of occurrences 1, 5, 10 and 20 days out. As in a previous study, we divide the volatility environment into 2 regimes: low (VIX<=20) and high (VIX>20). We used data from January 1990 to December 2017. The longer the time frame (days out), the stronger the mean reversion. If we don’t have a position prior to a spike, we then can take advantage of its quick mean reversion by using bounded-risk options positions. The Table below presents results for SPY from 1993 to the present. We performed the tests for 2 different volatility regimes: low (VIX<=20) and high (VIX>20). Note that we have tested other lookback periods and VIX filters, but obtained qualitatively the same results. 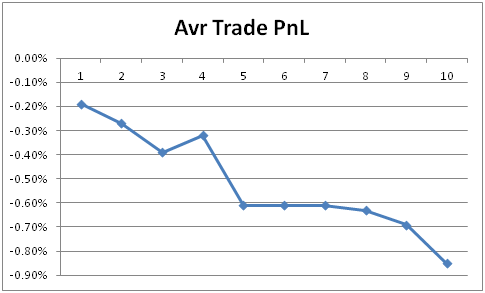 It can be seen that the average PnL for all trades is -0.3%, so overall shorting SPY is a losing trade. This is not surprising, since in the short term the SP500 exhibits a strong mean reverting behavior, and in a long term it has a positive drift. We still expected that when volatility is high, the SP500 would exhibit some momentum characteristics and short selling would be profitable. The result indicates the opposite. When VIX>20, the average trade PnL is -0.37%, which is higher (in absolute value) than the average trade PnL for the lower volatility regime and all trades combined (-0.23% and -0.3% respectively). This result implies that the mean reversion of the SP500 is even stronger when the VIX is high. Despite the fact that the short SPY trade has a negative expectancy, both the average and median MFEs are positive. This means that the short SPY trades often have large unrealized gains before they are exited at the close. Also, as volatility increases, the average, median and largest MFEs all increase. This is consistent with the fact that higher volatility means higher risks. The above result implies that during a sell-off, a long equity portfolio can suffer a huge drawdown before the market stabilizes and reverts. Therefore, it’s prudent to hedge long equity exposure, especially when volatility is high. An interesting, related question arises: should we use options or futures to hedge, which one is cheaper? Based on the average trade PnL of -0.37% and gamma rent derived from the lower bound of the VIX, a back of the envelope calculation indicated that hedging using futures appears to be cheaper. Is a 4% Down Day a Black Swan? On February 5, the SP500 experienced a drop of 4% in a day. We ask ourselves the question: is a one-day 4% drop a common occurrence? The table below shows the number of 4% (or more) down days since 1970. On average, a 4% down day occurred each 1.2 years, which is probably not a rare occurrence. We next counted the number of days when the SP500 dropped 4% or more during a bull market. We defined the bull market as price > 200-Day simple moving average. Since 1970 there have been 5 occurrences, i.e. on average once every 10 years. We don’t know whether this qualifies as a black swan event, but a drop of more than 4% during a bull market is indeed very rare. The table below shows the dates of such occurrences. It’s interesting to note that before the February 5 event, the last two 4% drops when price> 200-day SMA occurred around the dot-com period. Author rvarbPosted on February 28, 2018 Categories statistical arbitrage, volatility arbitrage3 Comments on Is a 43 Down Day a Black Swan? Last week, many traders noticed that there was a divergence between SPX and VIX. It’s true if we look at the price series. Graph below shows the 20-day rolling correlation between SPX and VIX prices for the last year. We can see that the correlation has been positive lately. However, if we look at the correlation between SPX daily returns and VIX changes, it’s more or less in line with the long term average of -0.79. So the divergence was not significant. The implied volatility (VIX) actually tracked the realized volatility (not shown) quite well. The latter happened to increase when the market has moved to the upside since the beginning of the year. In the previous post, we looked at some statistical properties of the empirical distributions of spot SPX and VIX. In this post, we are going to investigate the mean reverting and trending properties of these indices. To do so, we are going to calculate their Hurst exponents. There exist a variety of techniques for calculating the Hurst exponent, see e.g. the Wikipedia page. We prefer the method presented in reference  as it could be related to the variance of a Weiner process which plays an important role in the options pricing theory. When H=0.5, the underlying is said to be following a random walk (GBM) process. When H<0.5, the underlying is considered mean reverting, and when H>0.5 it is considered trending. Table below presents the Hurst exponents for SPX, VIX and VXX. The data used for SPX and VIX is the same as in the previous post. The data for VXX is from Feb 2009 to the present. We display Hurst exponents for 2 different ranges of lags: short term (5-20 days) and long term (200-250 days). We observe that SPX is mean reverting in a short term (average H=0.45) while trending in a long term (average H=0.51). This is consistent with our experience. The result for spot VIX (non tradable) is interesting. It’s mean reverting in a short term (H=0.37) and strongly mean reverting in a long term (H=0.28). As for VXX, the result is a little bit surprising. We had thought that VXX should exhibit some trendiness in a certain timeframe. However, VXX is mean reverting in both short- and long-term timeframes (H=0.46). Knowing whether the underlying is mean reverting or trending can improve the efficiency of the hedging process. VIX related products (ETNs, futures and options) are becoming popular financial instruments, for both hedging and speculation, these days. The volatility index VIX was developed in the early 90’s. In its early days, it led the derivative markets. Today the dynamics has changed. Now there is strong evidence that the VIX futures market leads the cash index. In this post we are going to look at some statistical properties of the spot VIX index. We used data from January 1990 to May 2017. Graph below shows the kernel distribution of spot VIX. It can be seen that the distribution of spot VIX is not normal, and it possesses a right tail. 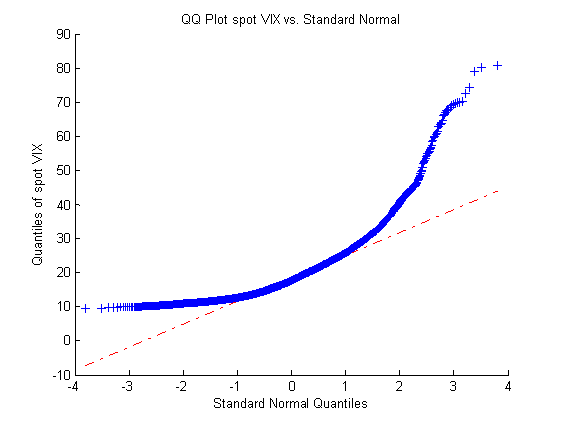 We next look at the Q-Q plot of spot VIX. Graph below shows the Q-Q plot. It’s apparent that the distribution of spot VIX is not normal. The right-tail behavior can also be seen clearly. Intuitively, it makes sense since the VIX index often experiences very sharp, upward spikes. It is interesting to observe that there exists a natural floor around 9% on the left side, i.e. historically speaking, 9% has been a minimum for spot VIX. We now look at the distribution of VIX returns. 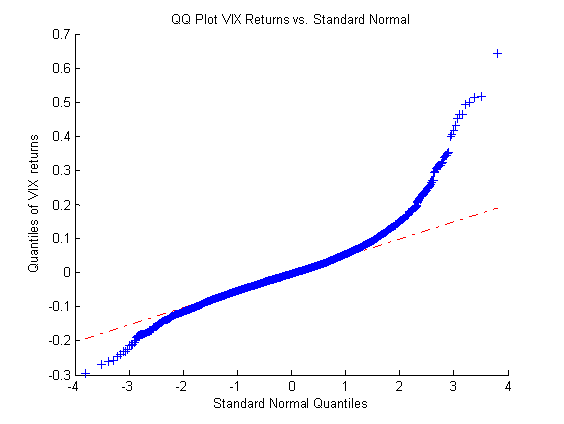 Graph below shows the Q-Q plot of VIX returns. We observe that the return distribution is closer to normal than the spot VIX distribution. However, it still exhibits the right tail behavior. 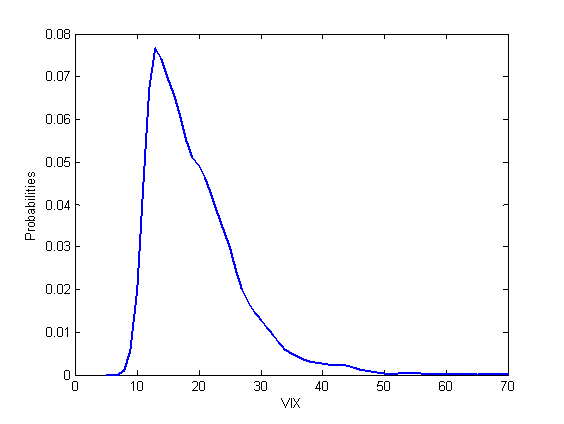 It’s interesting to see that in the return space, the VIX distribution has a left tail similar to the equity indices. This is probably due to large decreases in the spot VIX after sharp volatility spikes. The natural floor of the spot VIX index and its left tail in the return space can lead to construction of good risk/reward trading strategies. 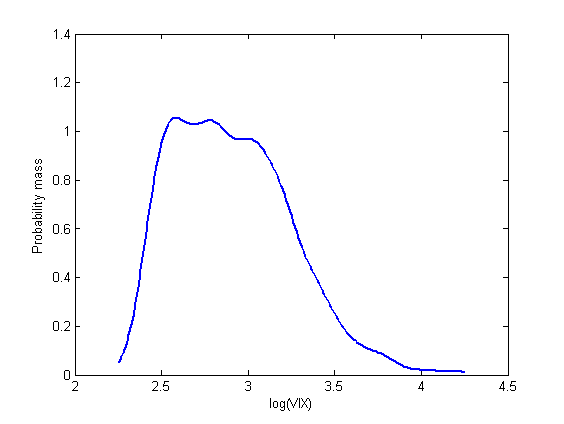 UPDATE: we plotted probability mass function of spot VIX on the log scale. Graph below shows that spot VIX spent most of its time in the 12%-22% (log(VIX)=2.5 to 3.1) region during the sample period. This post is the continuation of the previous one on the riskiness of OTM vs. ATM short put options and the effect of leverage on the risk measures. In this installment we’re going to perform similar studies with the only exception that from inception until maturity the short options are dynamically hedged. The simulation methodology and parameters are the same as in the previous study. Similar to the static case, delta-hedged OTM put options are less risky than the ATM counterparts. However, the reduction in risk is less significant. This is probably due to the fact that delta hedging itself already reduces the risks considerably (see below). It is important to note that given the same notional amount, a delta-hedged position is less risky than a static position. For example, the VaR of a static, cash-secured (m=100%) short put position is 0.194, while the VaR of the corresponding dynamically-hedged position is only 0.0073. This explains why proprietary trading firms and hedge funds often engage in the practice of dynamic hedging. Finally, we note that while Value at Risk takes into account the tail risks to some degree, it’s probably not the best measure of tail risks. Using other risk measures that better incorporate the tail risks can alter the results and lead to different conclusions.